Can I afford to build a custom home? Nothing at GreenWood is canned. 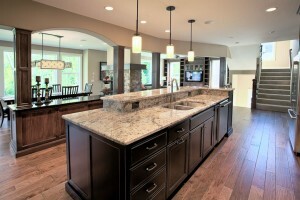 Our custom homes, inspired by our clients, are fresh, exciting and functional. Our starter homes can be pushed pulled, narrowed and stretched to make them fit you perfectly; You have a budget, you have a budget and we have a solution. A builder can pile square footage into a house and assume the client will make the best use they can out of it. What we do is different. You have routines and ways of doing things, and your new home should reflect not only your style, too. We listen to your needs, wants and wishes and ask the right questions so we can learn how you live in your home. The hallmark of GreenWood is a painstaking focus on clients’ wishes and ideas, no matter what the budget. Are there unique ways to save money, time and stress? The unique partnership between our architectural designer and builder at GreenWood ultimately saves you money, time and stress. Doug, our architectural designer, and Scott, our builder, the founders and partners of GreenWood have seen firsthand the benefits of having the builder and designer working together. This unique partnership saves clients time, money, and frustration and ultimately leads to a more enjoyable experience. GreenWood will be your partner in the home building process, listening to your ideas and creatively expressing them into a custom home built just for you. Can I find a knowledgeable builder? With over 30 years of combined experience, GreenWood’s owners have a strong history in the design-build business. Since we opened the doors we’ve been setting ourselves apart. Our interests lie in building you more than just another house. We listen, we understand and we use our knowledge to translate your needs and wants into something more. Our mission is to show you why you should choose GreenWood to build your HOME.